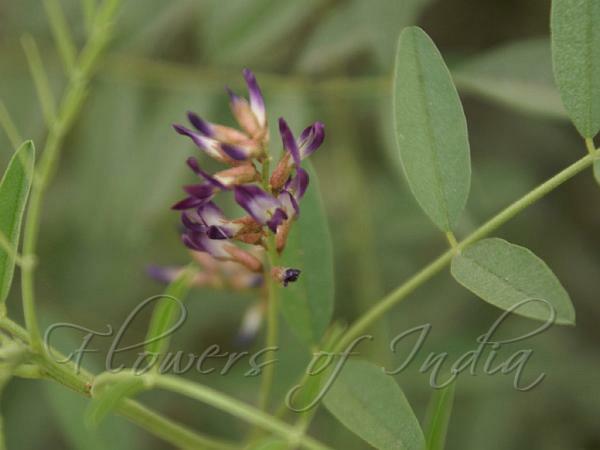 The licorice plant is a perennial herb, growing up to 1 m in tall, with pinnate leaves about 7-15 cm long, with 9-17 leaflets. The flowers are 0.8–1.2 cm long, purple to pale whitish blue, produced in a loose inflorescence. The fruit is an oblong pod, 2-3 cm long, containing several seeds. The flavor of liquorice comes mainly from a sweet-tasting compound called anethole, an aromatic, unsaturated ether compound also found in anise, fennel, and other herbs. Additional sweetness in liquorice comes from glycyrrhizic acid, an anti-viral compound sweeter than sugar. Liquorice flavouring is also used in soft drinks, and in some herbal teas where it provides a sweet aftertaste. The flavour is common in medicines to disguise unpleasant flavours. Medicinal uses: Liquorice may be useful in conventional and naturopathic medicine for both mouth ulcers and peptic ulcers. In traditional Chinese medicine, liquorice is commonly used in herbal formulae to "harmonize" the other ingredients in the formula and to carry the formula to the twelve "regular meridians" and to relieve a spasmodic cough.